Why do animals that live in caves become blind? This question has long intrigued scientists and been the subject of hot debate. Clearly, across the animal kingdom, blindness has evolved repeatedly. There are thousands of underground and cave-dwelling species, from naked mole rats to bats, and many have lost their sense of sight. Charles Darwin originally suggested that eyes could be lost by "disuse" over time. But Reed Cartwright, an ASU evolutionary biologist in the School of Life Sciences and researcher at the Biodesign Institute, may be proving Darwin wrong in a recent publication in the journal BMC Evolutionary Biology. 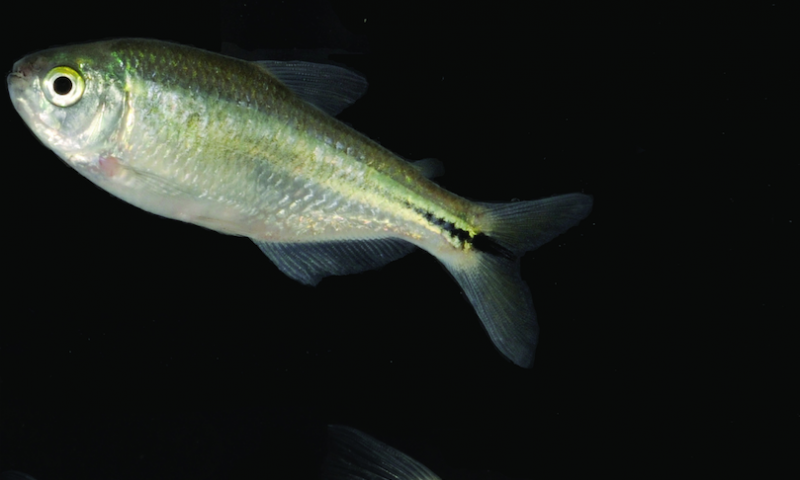 "We think that blindness in cavefish is indeed Darwinian, but ultimately this disproves Darwin's original hypothesis of 'disuse'," Cartwright said. In new research, he explains that eyes are not lost by disuse, but rather a demonstration of Darwin's fundamental theory of natural selection at work—with blindness selected as favorable and the fittest—for living in a cave. For their work, his research team choose to model a well-studied blind cavefish, the Mexican tetra (Astyanax mexicanus), a small, docile, pink-hued fish just a few centimeters long that could easily make its home in an aquarium. It's inhabited caves for 2 million to 3 million years, giving it 5 million generations worth of time to evolve blindness. Cartwright's group chose this Mexican tetra because there is also a surface-dwelling form that has retained its sight. And for scientists, this built-in comparative power makes it a good choice for further exploration. They have two populations to study that can interbreed and are polar opposites for physical traits. So Cartwright's group decided to use computational power to investigate how multiple evolutionary mechanisms interact to shape the fish that live in caves. "The problem we have in these caves is that they are connected to the surface, and fish that can see immigrate into the cave and bring genes for sight with them," Cartwright said. "Under these conditions, we don't typically expect to find such a difference in traits between surface and cave populations. Unless selection was really, really strong." How strong? In their model, the selection for blindness would need to be about 48 times stronger than the immigration rate for Mexican tetras to evolve blindness in caves. Cartwright's group estimates that a measure of fitness for blindness, called the selection coefficient, in the tetra is between 0.5 percent and 50 percent. These coefficients are high enough that laboratory experiments should have detected a difference between surface and cave forms of the fish; however, none have to date. Cartwright's team turned to a hypothesis going all the way back to a letter to the editor of Nature in 1925 by E. Ray Lankester, that essentially stated that the reason you have blindness in caves is because the fish that can see simply leave. "If sighted fish swim towards the light, the only fish that stay in the cave are blind fish. They aren't trying to get to the light anymore because they can't see it. Which actually is a form of selection, and thus, Darwinian evolution in action," Cartwright said. According to Cartwright, explaining a fitness difference as big as 10 percent between sighted and blind fish may be difficult, "Iosing eyes might not give you 10 percent more offspring. However, if 10 percent of your seeing-eye fish leave the cave, the migration rate is reasonably low, and that could be enough." If over time, enough of the seeing-eye fish are systematically being removed, they will also be removed from the gene pool, and that could be enough to drive the evolutionary process. It could be this sort of habitat preference that maintains the local blind fish population, and the fish that can see are preferentially moving out of the cave. "We found that even a low level of preferential emigration, e.g. 2 percent, would provide a significant boost to local adaptation and the evolution of blindness in caves." Cartwright's team hopes that field biologists begin to consider Lankester's 90-year old hypothesis when studying cavefish. "It would be great if someone could develop a study to test Lankester's hypothesis and whether it is driving the evolution of blindness in caves. That would really help answer one of the questions that have intrigued biologists for over a century." I had always thought that fish which did not develop eyes had an advantage in a cave environment because the delicate eyes of a fish, in a dark cave, would be constantly subject to damage striking rocks, etc. in the dark which would set up infections and/or other diseases which would select against the sighted fish. Sighted fish seeing the opening and swimming out would be a factor only very near the opening. The brainpower of non-sighted fish should be given over to different senses (much like blind people use the visual cortex to process auditory cues). So there may indeed be an avantage in finding food/mates for blind fish that significantly increases survival/progeny beyond simply 'not swimming towards light'. Maybe there should be a comparative study between the two groups of animals to check whether their sense chemicals in the water or reaction sensitivity to pressure cues differ?